The movie may still be playing on one of the cable channels (like USA, TNT, FX, etc. ), so check your listings. (You can also watch the film free online, but McAfee doesn’t seem to want me to go to that site). *“The Mischievous Chicken” is a section of The Nothing and the Everything (1981) by Bhau Kalchuri, in which Bhau has written up “points” given to him directly by Meher Baba, said to be from the mysterious Book that Baba had written. The story of the Mischievous Chicken might be called Baba’s “creation myth.” In it the Chicken is identified with the Avatar, the first soul who emerged from the infinite Ocean of unconscious God and crossed the seven planes of consciousness to arrive at God-realization, the state of conscious God. 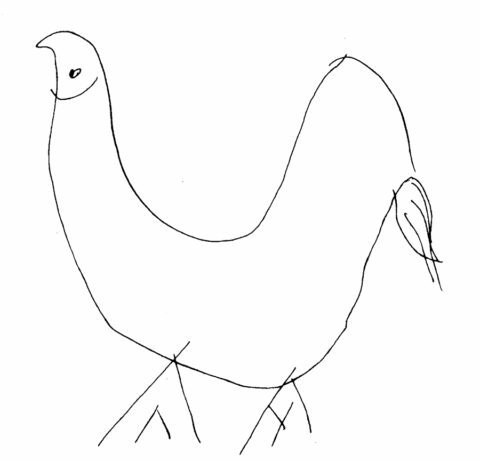 Meher Baba drew the accompanying whimsical image of the Mischievous Chicken, which many years later was printed by Baba-lovers on T-shirts and other items. In 2002 Bhau wrote a children’s book of stories (as Baba had told him to do in 1968), including the tale of the Mischievous Chicken. It is titled Nectar for the Children and illustrated by Nadia Wolinska.